Abel Briquet (1833-1926) and an early photograph of Lake Chapala? We stand corrected! We had thought that perhaps the earliest known published photograph of Lake Chapala was that signed “A. Briquet” which is included opposite page 224 in Chapter XVI of Thomas L. Rogers’ book Mexico? Sí, señor! in 1893. 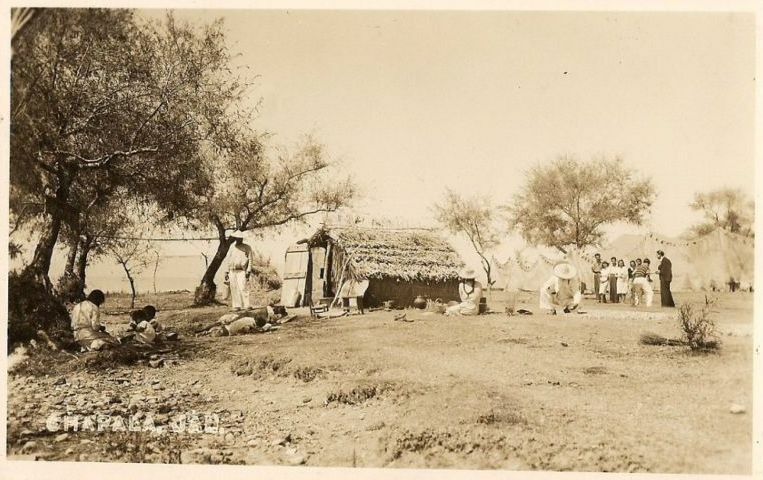 The photo (below) is titled “On the Lake Shore” and shows a small settlement of humble fishermen’s huts. In general, all the photos scattered through Rogers’ book appear to be positioned so as to relate to the text near them, which led us to assume that the photo most likely showed Lake Chapala. The chapter is about the “Guadalajara division of the Mexican Central Railway” and includes a detailed description of Lake Chapala (a short distance south of the line). Rogers visited Lake Chapala in 1892 and a Chapala-related extract from his book appears in chapter 36 of my Lake Chapala Through The Ages: an anthology of travellers’ tales (Sombrero Books, 2008). However, kudos to alert reader Yvonne Lauterbach (see comments following this post) who has pointed out that the identical photograph in the Abel Briquet Photographic Collection of the University of Texas at Austin is entitled “El Lago de Cuitzeo”. El Lago de Cuitzeo (Lake Cuitzeo) is never mentioned by Rogers in his book, and is located a significant distance away from the the Mexican Central Railway. However, there seems little doubt that the photo shows Lake Cuitzeo since the title appears to have been chosen by Briquet himself, when he included it in his series Vistas Mexicanas (“Mexican Views”). How did a photo of Lake Cuitzeo come to be included in a book that makes no mention of the lake? 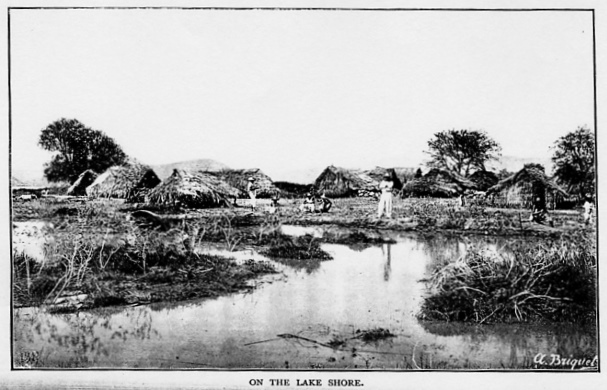 Presumably Rogers’ publisher decided they needed an illustration of Lake Chapala but, in the absence of locating a suitable image, chose to substitute this photo of Lake Cuitzeo, editing its original title to mask its true location. The other photos included in Chapter XVI of Thomas L. Rogers’ book Mexico? Sí, señor! are located correctly. The chapter includes a small photo of Ocotlán (on the lake, though the lake is not shown), and one of the Atequiza hacienda, as well as full page images of the Río Lerma and the famous Juanacatlán Falls. It also includes various line drawings, such as that of the Lake Chapala steamboat “Chapala”. The commercial photographer Alfred Saint-Ange Briquet, better known as Abel Briquet, was born in Paris 30 December, 1833 and died in Mexico in 1926. He began his photographic career in Paris in 1854, and taught photography at the French military academy of Saint Cyr. He seems to have visited Mexico several times prior to establishing residence here. The precise date he began working in Mexico is uncertain, but he closed his Paris studio in 1865. Eleven years later, in 1876, he was commissioned to record the construction of the Mexican National Railway line between Veracruz and Mexico City. Assisted by the patronage of President Porfirio Díaz (who loved all things French), Briquet spent the next 30 years undertaking commissions, such as one in 1883 to photograph Mexican ports for the shipping firm Compagnie Maritime Transatlantique. He also produced a series of commemorative photographic albums about Mexico, including Vistas Mexicanas, Tipos Mexicanos and Antiquedades Mexicanos. These works make him one of the earliest commercial photographers to work in Mexico, and one of the most prolific. Briquet’s photographs evoke a spirit of discovery as he traveled the length and breadth of Mexico recording the landscapes, flora and fauna, “typical” everyday scenes, buildings and monuments. His images of factories, railroads and other technological advancements show the extent of economic progress during Diaz’s ill-fated regime. Briquet’s photographic career stalled with the outbreak of the Mexican Revolution in 1910, in part because of his close ties to the former government. Meanwhile, the search for the earliest published photo that really shows Lake Chapala continues! Sombrero Books welcomes comments, corrections or additional material related to any of the writers and artists featured in our series of mini-bios. Please email us or use the comments feature at the bottom of individual posts. isn’t this actually a photo of lake cuitzeo michoacán ? I don’t believe so, though if you have evidence to that effect, I’d certainly be interested in learning more. The photo is included opposite page 224 in Chapter XVI and in general all the photos scattered through the book appear to be positioned so as to related to the text near them. As you probably realize, that chapter is about the “Guadalajara division of the Mexican Central Railway” and Cuitzeo is located a fair distance away from that line. The chapter also includes a small photo of Ocotlán, one of Juanacatlán Falls, and what is presumably Atequiza hacienda, as well as various drawings/sketches. picture #210 titled “El Lago de Cuitzeo, Pueblo de Pescadores, Ferrocarril Nacional Mexicano, Estado de Michoacan”… let me know what you think. Thank you very much indeed for taking the time and trouble to provide such compelling evidence that the photo is indeed of Lake Cuitzeo, not of Lake Chapala. We really appreciate your kindness in sharing your expert knowledge, and have amended the original post accordingly. Thanks again, and best wishes, TB.